Probably the toughest battle in the 2017 Rolex Fastnet Race was the duel for the lead in the largest class of the smallest boats, IRC Four. This was an all-French affair, both in French-built JPK 10.10 sisterships and both teams from northern France. However one was doublehanded from Cherbourg; the other fully crewed from Le Havre. And they have considerable history. 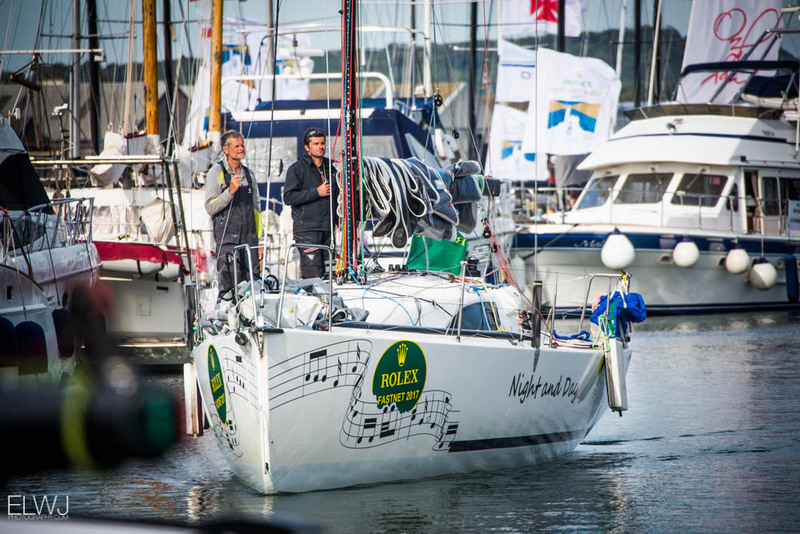 In 2013 the father and son team of Pascal and Alexis Loisin aboard Night and Day became the first doublehanded crew ever to win the Rolex Fastnet Race not just in their class, but outright, ahead of all the fully crewed boats. But in second place overall that year was Noel Racine’s Foggy Dew. This was also the case two years ago when Night and Day finished fifth overall with Foggy Dew ninth. 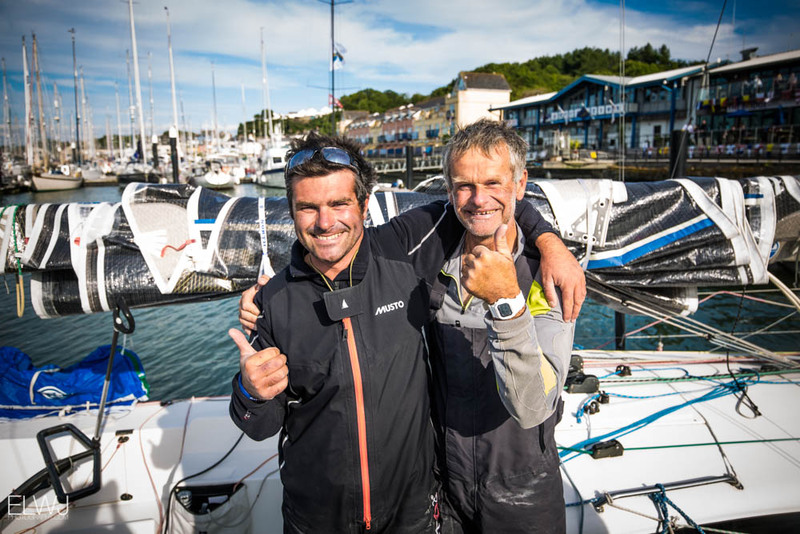 And while it would be nice to say that it was third time lucky for Racine’s Le Havre crew, in fact, Pascal Loisin, the Cherbourg-based orthopaedic surgeon and his professional Figaro sailor son Alexis prevailed once again. 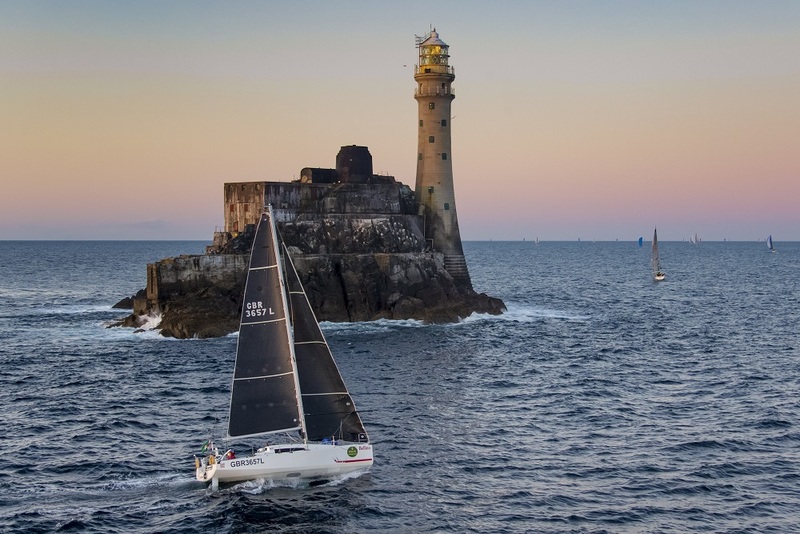 This time both boats were racing in the same class, Night and Day’s time correcting to out to 2 hours 13 minutes ahead of her rival, although this year neither made an impression on the overall IRC results, which favoured larger boats. The Loisins were pleased with their tactics at Portland Bill where they went very inshore (too far inshore, judging from the look on the face of père Loisin), however that gained them three miles. Crossing the Celtic Sea, their tactics were conservative, not hitting one or other side of the course hard although they are renowned for tacking on every shift. However they did err to the right of the rhumb line en route to the Fastnet Rock leaving them in good shape when the wind veered right. The fight for IRC Four honours was initially between four boats including the lead duo, another JPK 10.10 Richard Fromentin’s Cocody and the rather different S&S 41 heavyweight, Harry J Heijst’s Winsome. “The first to separate was Cocody which made a small mistake and after that it was Winsome and from Land’s End to the Fastnet it was just the two of us fighting,” recounted Racine. While the JPK 10.10s had the best conditions going to the Rock, the larger planing boats came into their own, recovering their lost time downwind and reaching in the second half of the race towards the Plymouth finish. 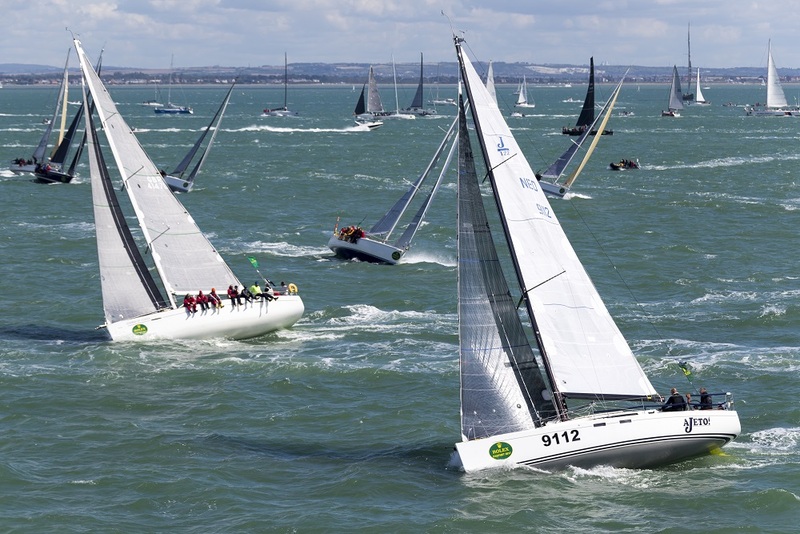 Aside from winning IRC Four, Night and Day also claimed the IRC Two Handed prize, which they had won in 2013 but lost to Kelvin Rawlings and Stuart Childerley on the J/105 Jester in 2015. This year, the Loisins said they had been worried about the bigger J/122e Ajeto! sailed by Dutch Two Handed Champions, Robin Verhoef and John van der Starre. The Netherlands boat had been leading the IRC Two Handed class until Night and Day finally overhauled them yesterday, leaving them second. The Dutch duo, racing their new boat which they have optimised for two handed racing, had an up and down race. This episode dropped them to 13th by the time they reached Land’s End, however they recovered this lost ground by going up the favourable east side of the Land’s End traffic separation scheme and then sailing into the favourable right hand shift in the Celtic Sea. However soon after they got stuck in another wind hole forcing them to back down the course and then sail south in order to extricate themselves. It was this that allowed Night & Day to move ahead of them in the IRC Two Handed class. Third overall in the IRC Two-Handed was Rob Craigie and Deb Fish on the Sun Fast 3600 Bellino. They are also the first winners of a new prize being offered to the first Mixed Two-Handed yacht overall. Craigie and Fish were generally pleased with their race. The low point was went the wind went light for them off Plymouth. Once again the blast back from the Rock was among the most memorable of sails. “It was moonlit night and we were hooning along, going like a train with a few dolphins around. It was just great, only we were having such a good time we overstood!” recalled Fish, who was helming at that point. The reach to the finish from Bishop Rock was a case of having the perfect sail for the job even if they were forced to push their asymmetric beyond its comfort zone. This morning, the sole remaining all-female IRC Two Handed yacht arrived in Kirsteen Donaldson and Judith Eastwood, sailing the X-332 Pyxis. Donaldson reported that the race itself was not without challenges.